A couple of days back, I had the opportunity to dine at Toh Yuen Chinese Restaurant in Hilton Petaling Jaya. The reason we were there was simple, to try out their ala carte menu, dicovering new flavours as well as enjoying Toh Yuen's all-time signature dishes. "Located inside Hilton Petaling Jaya, Toh Yuen Chinese Restaurant explores the authenticity of Chinese cuisine with a local, personal touch by crafting an extensive a la carte menu with recipes from China. Retaining one main concept from previous menu, Master Chef Lee emphasizes a healthy menu which consists of fresh ingredients and Chinese herbs. Introducing traditional Chinese fare to local food lovers, Chef Lee also keeps the natural flavours and refrains from using artificial preservatives and additives." Reaching the restaurant just in time for dinner, we were quickly ushered to our tables to begin our feast. 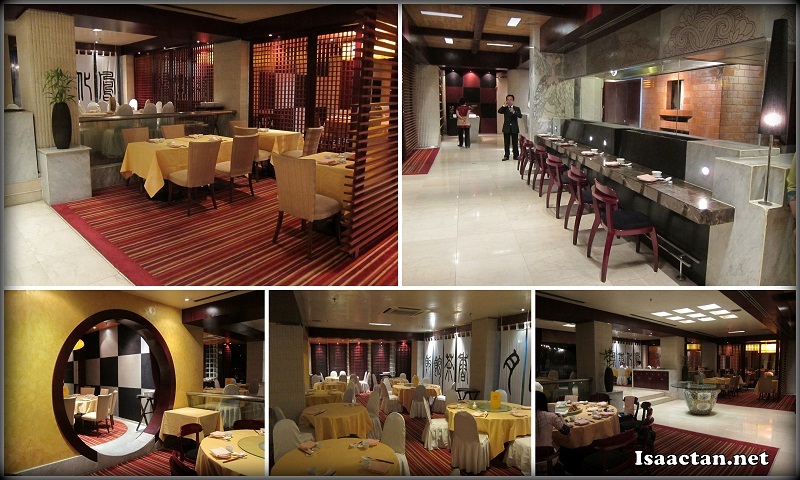 The ambiance of the restaurant itself exudes a certain classiness, with traditional Chinese decor all around. The host briefly introduced the dishes that we were going to have that evening, all of it having a simple approach to the Chinese authentic delicacies, with minimal adjustment to local taste buds. Check out below on what we had that wonderful evening. We kicked off the night of good Chinese food with 3 appetizers, beginning with one of my favourite soft shell dishes. Toh Yuen Restaurant came in with their own soft shell crab dish, the Deep Fried Soft Shell Crab with Garlic & Chicken Floss. Generous amounts of soft shell crabs were used in this dish, with the garlic kicking in to give it a very nice flavour. I'm so used to those soft shell crabs we have at those Japanese restaurants, that it was good to have the Chinese version of it. The next two appetizers that arrived on our table, the Deep Fried Lamb with Cumin & Dried Chilli, and the Chilled Pacific Clam with Salsa did not feel like appetizers at all. If at all, the portions and serving made it look like main course dishes. The lamb was done just nice, without the strong lamb taste, which I appreciated as sometimes the lamb taste can get a tad too overwhelming. I like the way the meat was tender enough to just munch on without using too much jaw muscles. The Chilled Pacific Clam with Salsa dish was a cold dish, with those clams that kind of reminded me of the tinned ones I used to have at home. However, combined with the assorted vegetables, it was a refreshing appetizer indeed. An authentic Chinese dinner would never be complete without a bowl of hot soup, and that was exactly what we had at Toh Yuen. Janice enjoyed the Double boiled Chicken with "Shi Hu" Soup as it had lots of these herbal taste, whereas for me I did enjoy my Double Boiled Village Chicken with "Chong Cao Hua" Soup. The soup itself had so much taste in it, that I would have thought they actually boiled it for over a week! Following the appetizers and the soup, we were treated to a slew of main course dishes ranging from vegetables and mushrooms, to prawns, ducks, fish and chicken. Needless to say, it was a whole lot of food for one night. The Braised Sea Cucumber with Flower Mushroom & Abalone Sauce came looking really pretty. At RM80 for the dish, you just have to appreciate the abundance of Sea Cucumber that came in that dish. Now I've always had nice steamed fish at Chinese restaurants, but this was my first time having the exotic and flavourful steamed cod fish. How's that for a luxurious dish? The Steamed Canadian Black Cod Fish with "Yu Feng" Ginger Sauce came at a price of RM32 per 100gm, but it was all worth it, as we really got to enjoy the fresh cod meat, flaking off easily. For someone who doesn't really fancy seafood, I'm now in love with the cod fish. Fresh prawns were the order of the day, as we were treated with these huge chunks of Sauteed Fresh Prawn with Salted Egg Yolk. Beautifully done and flavored with salted egg yolk, everybody loved this dish. The Deep Fried Smoke Duck with Fruit Sauce was another good tasting dish. Personally I thought it was smoked rather than deep fried, but the menu says otherwise. The fruit sauce coupled with some mango underneath really brought out the "duckiness" in this dish. The Sauteed "Gong Bao" Vegetarian Chicken with Yam Ring came in this really big dish, for vegetarian lovers. Personally I would have preferred some meat inside, but it was all good. The vegetarian chicken was a tad too salty for my liking though. I've always liked celeries and lotus roots, mostly because of their crunchiness when you bite into them. Throw in lots of pine nuts and you have Toh Yuen's offering of the Sauteed Celery with Lotus Roots & Pine Nuts. If after having all that, and you're still feeling hungry, then go for Toh Yuen's Fried Rice to fill that stomach. It's by no means less appetizing even if it was the last dish, as the variety of chicken meat, prawns and vegetables thrown in made this dish really tasty. We ended that wonderful evening of good Chinese food in Toh Yuen Restaurant with one of their specialty dessert, the Deep Fried Banana with Strawberry & Cheese Cake. It was a unique combination of banana, strawberry and cheese cake all put into one small sweet package and deep fried. One heck of a good combination to me, as I felt one piece just wasn't enough! Do check out Toh Yuen Chinese Restaurant in Hilton Petaling Jaya should you be in the vicinity. Dining at Toh Yuen is available daily for lunch and dinner. The new a la carte menu of Toh Yuen is pleasing to the palate, and healthy too. wow the smoked duck really looks awesomeness to da max! owis think on the smoked duck! The salted egg yolk prawns looks delicious too. Top notch presentation too - it's hard for Chinese dishes, only seen a few places who does it well. The Toh Yuen at Kuching Hilton is pretty good... This one looks even better, to be honest. Oooo...smoked duck, I like!!!! One thing about these restaurants in big hotels, our "good fried" is missing... Hehehehehehe!!!! The creamy prawns must be really good!!! Loved the ones I had at the Kuching outlet. OMG the sea cucumber! I love sea cucumber... haiz.. Thanks for sharing! Indeed you are passionate about food!